Google "streaming video downloader", you have a boatload of answers. Downloading and trying every streaming video recorder available online is not only going to be time-wasting, but also pretty pointless. No worries, the best downloaders for streaming videos so far are gathered here, including the fastest tools for Chrome, Firefox, Safari, etc. freeware, apps for such job to save streaming videos movies music to iPhone, iPad, iPod, i-Devices, Samsung, Blackberry, HTC, Android phones, tablets, etc. It is the best streaming video downloader for Safari, Firefox, Chrome, etc. to save free streaming free videos movies from YouTube, Dailymotion, Vimeo, Metacafe, and 300＋ sites to iPhone, iPad, Samsung etc. in a breeze. It handles a music video download within merely a few seconds without stuttering and enables you to capture streaming video of 720P, HD, 4K, 8K UHD, MP4, AVI, MOV, FLV, WMV, MTS, any format and any resolution. The streaming video downloading software also works like a charm in video conversion. You are allowed to convert video to MP4, WMV, MOV, AVI, over 180 video formats with zero quality loss. It is 100% clean, no poping up, no virus, no plugins, no adware. With intuitive interface, it is extremely simple to follow guide to download free streaming video to iPhone(6/Plus), iPad(Mini 2/Air 2), Blackberry, HTC, Samsung, etc. 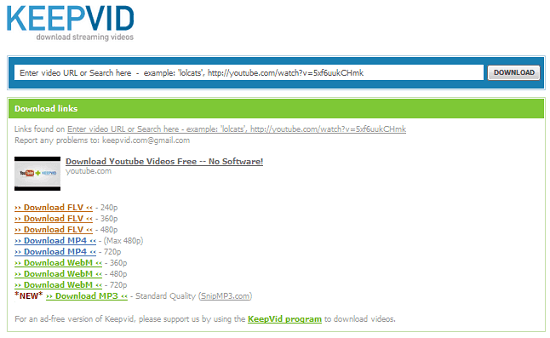 YTD Video Downloader is simple to use, thanks to its ability to track the video URL automatically. This free streaming video downloader is able to capture streaming video from over 50 video streaming sites and convert the videos to MP3, MP4, FLV, WMV, 3GP, AVI. It will cover your basic needs if you are a novice user. To download free streaming video to iPhone iPad, Samsung, computers, etc. you don't have to install any software, all you need is to copy and paste video URL. That is what Keepvid does. As a best-known online streaming video downloader, it downloads online videos from YouTube, Dailymotion, Vimeo, and other almost 50 sites in acceptable speed. Keepvid is not a good choice for antivirus people because it brings tons of ads and confusing download buttons and links, if so, change to download Keepvid alternative for Mac and Windows. Every well-marked download buttons are worth your attention before you start to capture streaming video files. Moreover, third-part help, Java Applet is required. Watch and think before you save streaming video with this online video downloader program. Video Downloader is a great streaming video downloader app for Safari. The best part is, this app is totally free, and there's no download limits. It supports saving streaming video of a wide range of formats, FLV(flash video), WMV, MP4, MOV, MKV, QT, to name just a few. But... if you want to download YouTube HD video free, Video Downloader could do nothing about it, let alone download free streaming video of 4K, 8K to iPhone iPad. From customer review, we get that the app will constant redirect you to the App Store and you can’t stop it. Ads are the biggest pits. Since being updated last time, Hubi is faster in responding. The free app for Samsung, Blackberry, HTC, and other Android devices supports massive(39) services, 180Upload, MovPod, MuchShare, FileBox etc. And you can share your favorite video links with friends directly. It is hard to get rid of ads unless select "Remove ads" for a small charge. It is not workable if you want to download video from Facebook, YouTube, Vimeo, Dailymotion, and other large video sharing. "Error" may occur, stability needs some improvement. The streaming video saver is lack of update, the last update can date back to 2013, that's why we can not rip streaming video off YouTube even now. 1 Free download the best streaming video downloader and launch it. Copy and paste the streaming video URL, click "analyze" to load the video details. Or hit "paste & analyze" button to detect the video opened in Chrome, Firefox, or Safari, etc. automatically. 2 Choose video format, resolution and file size available you want. You are free to download 8K movie video without stuttering. 3 Specify output folder on your computer to save streaming video file. 4 Click "Download Now" to start to capture free streaming video movies. You can download Taylor Swift songs, Shake It Off, Bad Blood, etc. Hindi songs, movie soundtracks, HD movie trailer, TV Shows and more. Summary: If you want to save streaming video fast yet free from ads and virus, MacX Video Converter Pro, an all-in-one streaming video movie downloader & converter is the ideal tool. I give it 4.5 star out of 5 stars. Keepvid wins 3.5 star for its great convenience in streaming video download online but with endless confusing pop ups and plugin required. YTD gets 3 stars because its lack of Mac version and stability needs to be enhanced. Video Downloader and Hubi are great free apps for iPhone 7/6S/6/Plus, iOS devices and Android, but would be better without ads. The review about streaming vs downloading comparison centers on the difference between streaming and downloading in terms of data usage, bandwidth, file size, legality as well as pros/cons to watch movies/videos/music through streaming and downloading. MacX Video Converter Pro is the best streaming video downloader that can easily download YouTube videos with original quality and fast speed. This feature-rich video downloader also can help you download 8K/4K UHD full movie/videos/music free from other 300+ online sites.